Most olive oil operations require a pump or pumps for the day to day operation of managing bulk oil. Whether it is for racking oils, transferring oil into different size containers, or blending, an appropriate-sized pump is invaluable. Frequently, transfer pumps are too large for bulk packaging uses and pumps good for packaging are too slow to use as transfer pumps. The E.P Mini Transfer Pump by Carpanelli fits nicely in the middle with a capacity of 3 – 5 GPM, depending on the hose size used with it. 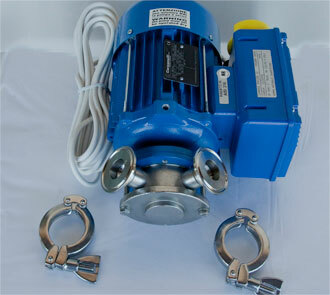 This pump utilizes a .75 horse power motor than can be configured as either a 110 V 60hz model or a 220V 60 Hz model. It has aneoprene food grade impeller pump with a speed of 1,020 RPM which protects oil by staying quite cool through isolation from the heat put off by the motor. The inlet and outflow from the pump utilizes the same butterfly clamp size on most stainless tank valves for easy interface. A reverse motor setting provides bi-directional flow. Variable length rigid or flexible tubing can easily be changed with this system as you work through the various tasks in your storage facility. When pumping oil off the top for racking, the flow rate is perfect for 55 gallon drums. At this rate, the pump action creates only nominal turbulence of the rackings. From an operations perspective, the pump can be left unattended until barrel levels are down to the last few inches, saving time and manpower. If you are filling 5-gallon containers, the flow rate is not so fast that you wind up with oil spilled everywhere. While not a pump for large scale operations, it is ideal for the small and mid-sized producer.